The Ugandan army has deployed approximately 1,500 soldiers to South Sudan and the Central African Republic. They are working closely with the U.S. military advisors in their common quest to apprehend the senior leaders of the Lord’s Resistance Army, or LRA. The Ugandan People’s Defence Force, or UPDF, continue to be the most capable and committed army in the direct fight against the LRA. But they are too few to cover the vast jungles where the rebels are hiding, and they face fundamental logistical and intelligence challenges, which severely limit their ability to locate and fight the LRA successfully. Unless bolstered and improved, the current strategy will fail short of ending the LRA. As the Enough Project’s LRA field researcher, I embedded with the Ugandan troops in August to get an up-close view of their challenges, and to find out what more is needed to end the LRA and bring the senior LRA commanders to justice. I shot this video during the trip that provides a clear illustration of how the dense jungle and the poor infrastructure force the UPDF to fly food and other basic supplies to their offensive trekking teams. 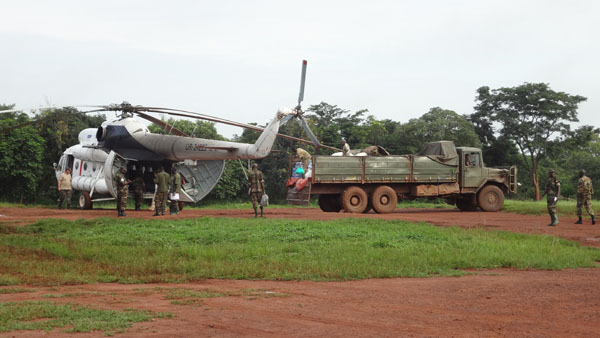 This is diverting scarce flight hours and limited resources away from direct counter LRA operations. "We do see their tracks in the jungle, but we rarely encounter the LRA directly. We are always a few steps behind and chasing an enemy that will do everything possible to avoid fighting, unless they choose to fight." The dispatch documents that the LRA continues to be a very real threat to civilians across the region; an example of this is the October 15, where the rebels attacked Pasi in the Congo, 13 huts were burned and four civilians reported missing. Newfound strength has enabled the rebels to commit daring attacks on regional security forces, which hasn’t been the case for the last couple of years. On September 4 a group of 30-40 LRA rebels attacked an armed military convoy of soldiers from the Central African Republic. The rebels fired a rocket propelled grenade straight at the front car, which was burned to the ground. The rebels looted automatic AK-47 machineguns and ammunition, and one soldier from the convoy was killed. Further, the dispatch finds that the U.S. aerial reconnaissance has not given the intelligence breakthrough that was hoped for. They are simply not able to ‘see through’ the triple canopy forest where the small and mobile bands of LRA rebels are hiding. The solution to the lacking intelligence is a much greater focus on human intelligence from defectors and civilians. Small-scale development projects like schools, road repair, and health clinics are instrumental in creating direct incentives for local populations across the LRA-affected areas to deliver information about LRA movements. The field dispatch concludes that the current counter LRA strategy is unsustainable and will be unable to end the LRA. A new and improved strategy is needed—one that includes access to all the areas where the rebels are hiding, improved human intelligence networks, infrastructure development, a surge in defection initiatives, and well trained Special Forces with sufficient transport options to ensure rapid movement of soldiers to remote areas with LRA activity.